A crowning moment in the life of a church-goer is the day they bring a visitor to church with them. There are many reasons why a visitor may attend… Maybe they’re seeking a relationship with God. Maybe they’re looking for a new place of worship. What about those who are just going to church this Sunday with a family member. At any rate, having a visitor go to church with you is a big deal and you should be commended for your efforts no matter what the occasion. Today our focus is on you, the person who’s bringing a visitor with them to church. 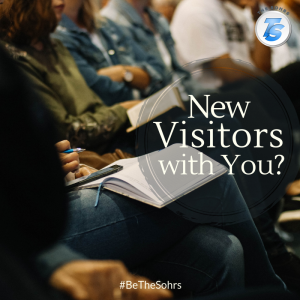 LIKE our social media post if you brought any new visitors with you to church this month. If you feel like showing more love, post a picture. It’s simple; just go over to Facebook, Twitter or Google+ and LIKE or SHARE. It’s time, our time to share with the world what we, as Christians, do. Let #BeTheSohrs!